Illinois Personal Injury Damages | Hupy and Abraham, S.C. It is impossible to undo the damage that has been done. Someone else was negligent and that negligence hurt you. The doctors’ appointments, the stress, and the inconvenience cannot be changed. However, you can—and you should—be compensated for your injuries. The goal of the legal damages that you may recover in a personal injury case is to make it as if the accident didn’t happen, to the extent that goal is achievable. Our experienced personal injury lawyers are committed to helping our clients get all of the compensation that they deserve. We will thoroughly investigate your crash and work hard to get you the full damages that Illinois law allows. What Are Your Potential Personal Injury Damages? Medical expenses. Medical expenses may include hospital stays, surgeries, doctors’ appointments, medications, medical devices, rehabilitation therapies and more. Lost income. Any income that you are unable to earn including, but not limited to wages, bonuses, benefits, and income from self-employment may be compensable. Out-of-pocket costs. Costs that you incurred as a result of the accident, such as household help or child care help, may be compensable. Pain and suffering. Your physical pain and emotional suffering can be among your most significant damages. While they are more difficult to prove than economic damages, such as medical expenses for which you have a bill, they can be proven and you can be compensated. Punitive damages. Punitive damages are not available in all Illinois personal injury cases. However, if the defendant acted egregiously then Illinois law may permit your recovery of this type of damages to punish the defendant and discourage similar behavior in the future. Together, these damages can compensate you for the harm that has been done to you and, if appropriate, punish the defendant. Your fair recovery starts with gathering evidence and hiring an attorney to make compelling arguments either to the insurance company during settlements negotiations or to the court during litigation. Expert witness testimony may be necessary to establish the amount of future damages such as lost income and medical costs. 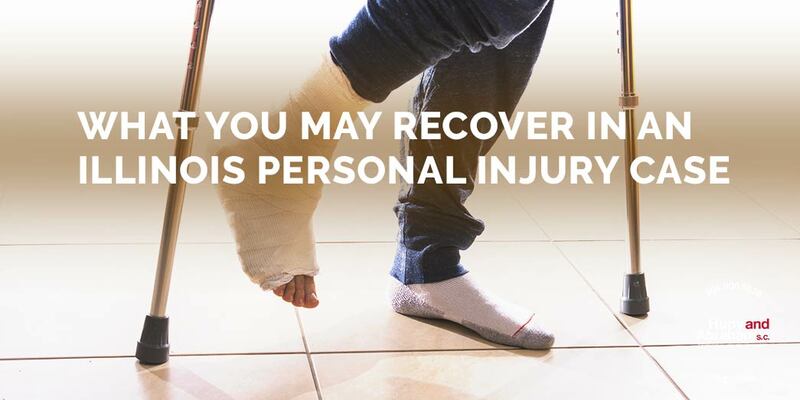 If you've sufferred a personal injury in Illinois you need to speak with an experienced personal injury attorney. For more information about protecting the recovery that you deserve, contact us online or call us directly at 800.800.5678 for a free and confidential consultation. We have three conveniently located offices in Illinois—Bloomington, Gurnee, and Rockford—and we would be pleased to meet with you at any one of them.